If I was magically cured from my Alzheimer’s, what would I do with the remaining portion of my life. I have lived so long in the world of dementia that this is my home. It is a strange place but I learn how to adapt to the many changes and the people in my world do not pretend to be anymore then what they are. I no longer would have a purpose in life and I wonder if I would lose the gift to help others. What would happen to my passion and the fight I am fighting. Would I no longer have a reason to live and just be counting the days. Maybe that is why I fight so hard for a better quality of life and ways to live with our disease then a cure. I am past the time of wishing for a cure and just want to fight for the rights of everyone living with dementia. The day will come when a cure is found and people will adapt to a World Without Dementia and we will know that all the hard work paid off and we won. Why can’t someone write a book about the type of dementia that me and millions others are living? I was diagnosed with dementia, probably Alzheimer’s, eleven years ago and don’t consider myself in the later stages of my disease. I am not bed ridden and consider myself to be very active as a human being. I do not need anyone to think for me just help me make the right decisions at times. Most writers jump on the late stage bandwagon and give their advice on how to treat someone with dementia as though we are all in their late stages.. So many listen to this advice and automatically assume that everyone of us that have dementia is in their late stages. I could scream when I hear a expert lay out a plan on how to treat me because I am not in the stage that they know. You smother me with protection and I will let you know what you can do with it. Let me live the type of life you are living for as long as I can, that may be 30 years from my diagnosis. We promote early diagnosis of dementia so we can adjust our life for what lies ahead. That does not mean we are in need of constant care and someone needing to make decisions for us I believe many speak out on the care of someone with dementia after dealing with it for many years. They only remember what it was like toward the end and that is what they write and speak about. Lets turn our attention to informing care partners how to help us live a productive life and less on how to care for us until we reach the stage when we can no longer care for ourselves. So many with dementia live alone without someone caring for them and could benefit from information on caring for themselves. Being a advocate and living with dementia, I see both side of this horrible disease. I often speak about what it is like living with dementia and the hardships we face. I write a blog at http://www.mythoughtsondementia.com where I try to explain what my thoughts are at the time so you may have a better understanding what our life is like. I also get to hear and see what it is like being our care partner. The stories I hear brings me so close to tears I could scream. I hear the stories how someones loved one that has dementia is turning into this nasty hateful person that they don’t recognize or understand. I try to comfort them in telling them to remember it is the disease and not the person. Hate the disease but not the person. The stories that hurt the most is when I hear that someone is placed in a care facility due to safety or needing additional care and their care partner experiences the lose of the person they love. The reality of dementia hits home and even though the person is still alive, you know they lost them. They have no idea what to do with their time and mourn their loved one. I can only sit with them and share their lost. and I am planning on living there. Someday I will be there but not until I complete what is expected of me in this life. we now need to find ways to live a better life during our journey. the mental disconnect can be sometimes worse. The emptiness we feel can last a lifetime. I want to read about a better quality of life for those living with dementia. I was taught the things that you don’t learn in a book. and saw firsthand what dementia does to a person. because I am living it. because I believe that benefits no one. November is National Alzheimer’s Awareness Month although it is not the only form of dementia, it is the one I was diagnosed with. I will be doubling my efforts to plead and beg people to join our effort in bringing awareness not only to Alzheimer’s but to every form of dementia. 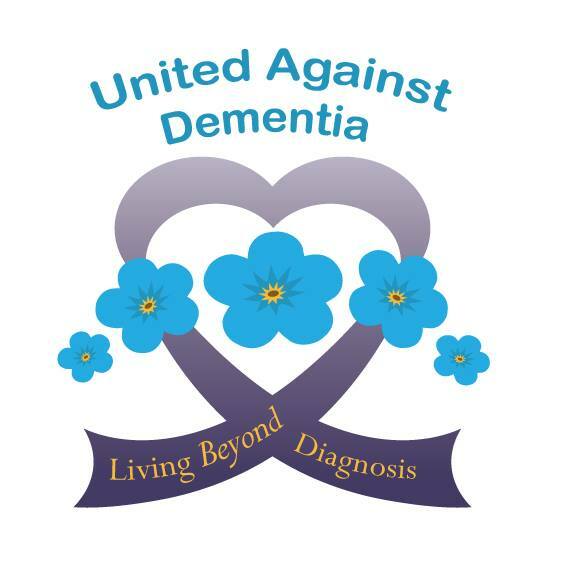 We need to be United Against Dementia if we are going to make a difference. I will be wearing purple to show I am proud that I not only live with dementia but made a vow to fight it until my last breath. everyday living with this disease. We need to push our governments into making it easier for us living this disease and demand that we need a cure. Let’s make November a month to go down in history. Can you imagine what it is like to be alone, living with dementia. Who do you seek for a hug when you get scared of what is happening to you. So many are lost in this world and no one cares for them. and I am not able to cry for them because I am all cried out. I stop what I am doing and give them some of my time. someone to come into their world and sit with them for a while. you are letting them know that someone does care. Few ever to get to feel the emptiness we feel. you will be hooked on raising dementia awareness forever.